A selection of various kinds of alcoholic beverage. The interior of a liquor store in the United States. The global alcoholic drinks industry is expected to exceed $1 trillion this year. 2004 data of alcohol consumption per capita (age 15 or older), per year, by country, in liters of pure alcohol. Wine is used as food drink, and psychoactive drug that often are intended for health effects but may instead cause high-functioning alcoholism. 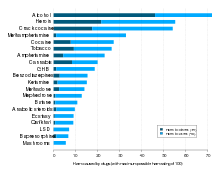 Results of the ISCD 2010 study ranking the levels of damage caused by drugs, in the opinion of drug-harm experts. ↑ "Minimum Age Limits Worldwide". International Center for Alcohol Policies. Retrieved 2009-09-20. ↑ "Global Status Report on Alcohol 2004" (PDF). 2004. Retrieved 2013-04-02. ↑ Caan, Woody; Belleroche, Jackie de, eds. (11 April 2002). Drink, Drugs and Dependence: From Science to Clinical Practice (1st ed.). Routledge. pp. 19–20. ISBN 978-0-415-27891-1. ↑ Cancer research UK: Alcohol and cancer "There is no doubt that alcohol can cause seven types of cancer"
↑ Nielsen, S.J. et al. (2012). Calories Consumed from Alcoholic Beverages by U.S. Adults, 2007-2010. Hyattsville, Md. : U.S. Department of Health and Human Services, Centers for Disease Control and Prevention, National Center for Health Statistics. ↑ USA (2013-03-25). "Disparity between tonic and phasic ethanol-induced dopamine increases in the nucleus accumbens of rats". Ncbi.nlm.nih.gov. Retrieved 2013-09-17.